Comedy Central, the #1 brand in comedy, today announced a new late night series with David Spade; the return of Crank Yankers; a second season order for new, hit scripted series The Other Two; the first look at new scripted comedy South Side; and scripted projects in development with Naomi Ekperigin, Matteo Lane and Samantha Irby. The announcements come on the heels of Comedy Central's seventh consecutive quarter of year-over-year share growth. While Comedy Central remains the #1 full-day cable entertainment network with people 18-34, in 2018 the brand recorded its highest-rated year among women 18-49 since 2014, up +13% from the previous year. To start 2019, The Daily Show with Trevor Noah is the highest-rated late night series across all of TV among men 18-34. 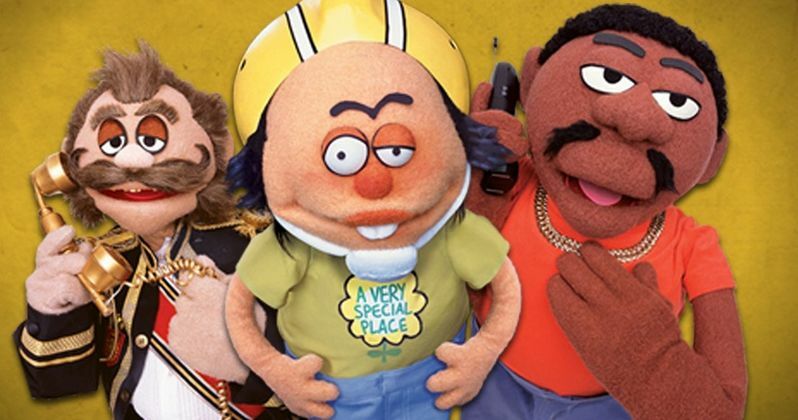 Comedy Central ordered 20 episodes of 30-minute comedy Crank Yankers, marking the beloved series' return to the brand. Updated for a digitally driven audience, the world's favorite profane puppets will be pranking on phones, social media, e-sport platforms and any venue where trouble can be made. This will be Jimmy Kimmel's first project for his newly formed production banner KIMMELOT. Jonathan Kimmel will serve as showrunner and executive producer, joined by executive producers/creators Jimmy Kimmel, Adam Carolla and Daniel Kellison. said Jimmy Kimmel. "Crank Yankers has always been my favorite show to make. Nothing is more fun or makes me laugh harder than a great crank call and I am thrilled that Comedy Central asked us to do it again. At this time, I would like to ask all Americans to disable their caller ID. Thank you." Comedy icon David Spade will lead a new 11:30 p.m. series featuring his signature take on the pop culture news of the day (watch his announcement here). The yet-to-be-titled David Spade Late Night Comedy Central series will include a rotating group of Spade's comedian and celebrity friends, while also incorporating field segments that mirror his popular Instagram stories. The show will follow The Daily Show with Trevor Noah on Monday through Thursday nights starting later this year. The show is executive produced by Spade, Alex Murray and Marc Gurvitz. Brad Wollack and Tom Brunelle of Free 90 Media serve as executive producers and showrunners. The brand ordered a second season of the critically-adored 30-minute series The Other Two, which is already "Certified Fresh" on Rotten Tomatoes. Created and written by former Saturday Night Live head-writers Chris Kelly and Sarah Schneider, the Emmy-contending series stars Drew Tarver as a 28-year-old actor struggling to get better auditions than "Man At Party Who Smells Fart," and Heléne Yorke as his 30-year-old sister, who is struggling in general. As the two work toward finding themselves, their lives are completely upended when their 13-year-old brother, ChaseDreams played by Case Walker, becomes incredibly famous overnight. The Other Two also features Molly Shannon, who plays the siblings' fame-ready mother, Ken Marino as ChaseDreams' newly-hired manager and Wanda Sykes as Chase's publicist. The series airs Thursdays at 10:30 p.m. ET/PT. Scripted comedy South Side debuted its first look ahead of a summer premiere and teased the first season guest stars, which includes Lil Rel Howery, Nathaniel "Earthquake" Stroman, Jeff Tweedy, LisaRaye McCoy, Kel Mitchell and Ed Lover. The aspirational, scripted comedy is set in and around the working class neighborhood of Englewood on the South Side of Chicago. The show follows two friends who just graduated community college ... so now they're ready to take over the world! But until they do they're stuck at Rent-T-Own, a retail-rental crossroads where the South Side's vast ensemble of characters come together. Despite the obstacles of inner-city life, these friends and their co-workers all strive to achieve their entrepreneurial dreams. Brought to life by local Chicagoans, both in front of and behind the camera, this show gives viewers an authentic portrayal of what life on the South Side is all about. South Side is written by Bashir Salahuddin (Glow) and Diallo Riddle (Marlon). Salahuddin, Riddle, and Michael Blieden - all Late Night with Jimmy Fallon alumni - are executive producers. Bashir Salahuddin and Riddle star in the series, alongside Sultan Salahuddin and Chandra Russell. The brand is also developing a scripted comedy starring Matteo Lane, titled The Chameleon. The show is about an extraordinarily talented, yet chronically broke entertainer who unwittingly stumbles into a world of covert operations and international espionage, where he's finally offered his big break ... as the government's most fabulous spy. Lane and Jared Lapidus are the writers and creators of the series. They serve as executive producers with Ryan Ling of Bird Brain. Along with executive producers Abbi Jacobson and Jessi Klein, Comedy Central is developing a scripted series from Samantha Irby based on her wildly successful book of essays, Meaty. The show follows 20-something Sam as she tries to laugh her way through failed relationships, identity crisis, her sexuality and a recent Crohn's disease diagnosis, among other challenges. Irby is the creator, writer and also an executive producer.